Local Falun Gong practitioners set up a booth in downtown Perth, Western Australia on June 11. 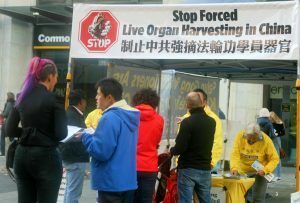 They demonstrated the Falun Gong exercises and raised awareness about the persecution that the peaceful spiritual practice continues to face in China today. 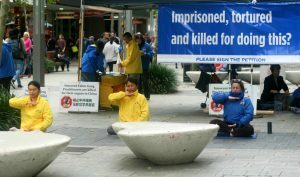 Demonstrating the Falun Gong exercises in downtown, Perth, Australia, on June 11. 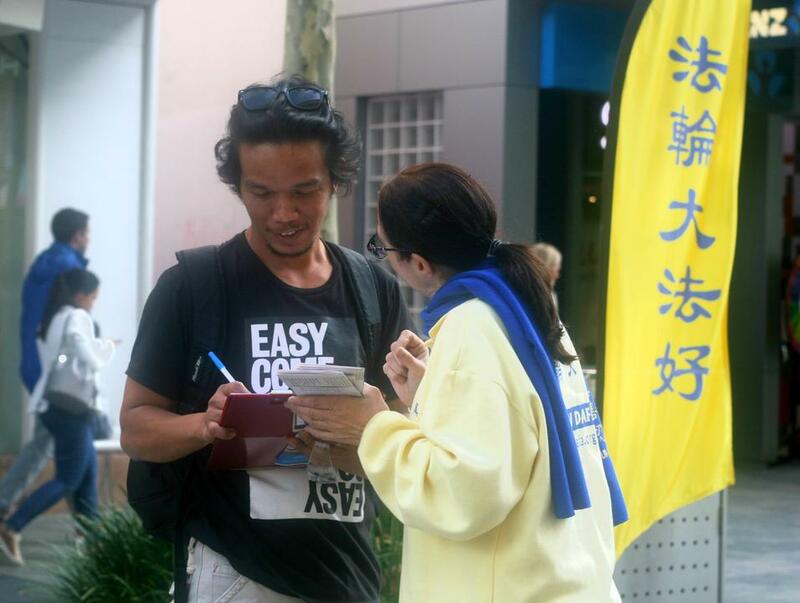 The young man also learned that Falun Gong is an ancient Chinese cultivation practice that promotes mental and physical health and uplifts the spirit. He signed a petition calling for an end to the persecution. Two other passersby, Georgia Fealey and Catherine Vernon, asked if they could sign the petition since they are not 18 yet. 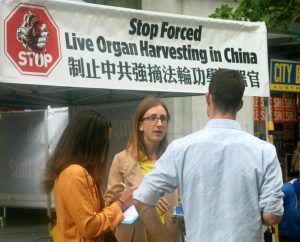 They were told that anybody can help, and that many people at their age or younger practice Falun Gong, yet are persecuted in China. The two girls signed their names with tears in their eyes, and asked for materials to help them spread the word on their social media accounts. Many people learned about the persecution and signed a petition condemning it. Mark Cleaver and his wife Yara had heard about the suppression of beliefs in China, and understand that the Communist Party only wants people to believe in what the Party wants them to. 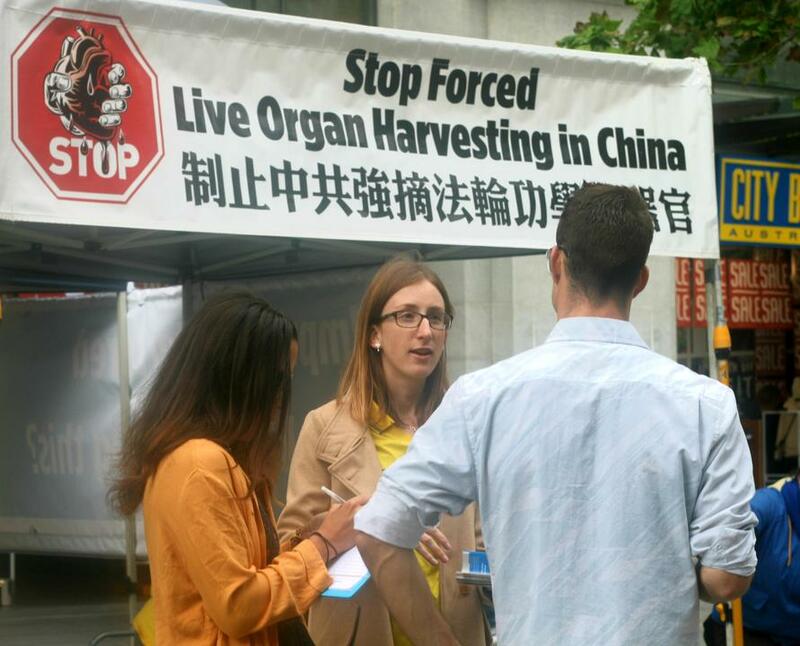 But the couple had never heard that state-sanctioned organ harvesting atrocities were happening in China; that prisoners of conscience are being killed to harvest their organs for sale on the black market. “This is absolutely unacceptable, and it must be stopped!” They signed the petition. Rose Whitchurch also couldn’t believe it when she heard about the organ harvesting atrocities. Practitioners showed her reports prepared by independent investigators, and she signed the petition. She said that she will share the information with her friends and family. A visitor signing the petition condemning the persecution of falun gong in China. A passerby named Paul Goerke read the petition out loud. He immediately decided to sign it and happily found that one of his friends had already signed. He said that he would pray for an end to the persecution each day. 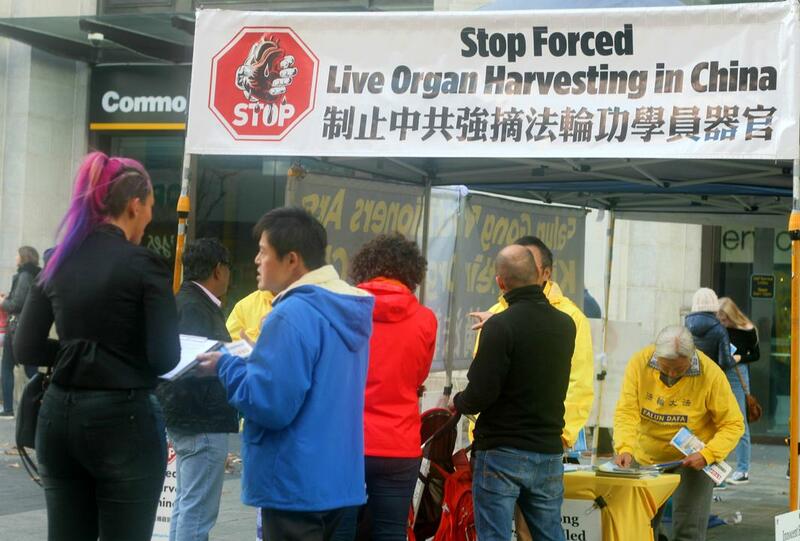 More learning about the falun gong persecution in China. The negative attitude of the Chinese men disappeared. They each took a booklet, and started reading right away.